As already emphasised, the one and only Paramatman is revealed as so many different deities. If one person develops a great liking for a certain deity, another chooses to have a liking for some other. To make a man a confirmed devotee of the form in which he likes to adore the Lord, the Paramatman on occasion diminishes himself in his other forms. Tirukandiyur is in Tanjavur district, Tamil Nadu. In the temple here Siva is seen to be a lesser god than Visnu. He once plucked off one of Brahma's heads, became thus the victim of a curse and was freed from it through the grace of Visnu. In the same district is Tiruvizhimalai where it is Visnu who is seen to be a lesser god than Siva. Reciting the "Siva-Sahasranama"(The One Thousand Names of Siva), Visnu offers lotuses at the feet of Siva. When he is nearing the end of his worship he finds that he is short of one lotus. What does he do now? Visnu, the lotus-eyed, digs out one of his own eyes and offers it at the feet of Siva. The latter is pleased and gives him the cakra or discus. Siva is called here"Netrarpanesvara"(Siva to whom an eye has been offered); at Tiruakandiyur Visnu is "Hara-sapa-vimocana"(one who freed Siva from a curse). When we listen to the story of Tirukandiyur we learn that Visnu is a god of great compassion who frees his devotees from the most terrible of curses. Similarly, from the Tiruvizhimalai story we realise that no sacrifice is too great for a devotee- Visnu offers one of his own eyes to the god he worships, that is Siva. The question here is not who is the greater of the two, Siva or Visnu. In the old days we used to have the lanterns in our homes. There were lanterns with glass on all the four sides- or three sides. Let us take the latter type. The wick inside the glass is lighted. The three sides made of glass are painted in three different colours [or only two sides are painted]. The light burning inside will be seen to be a different colour from each side. We may take these three sides to represent creation, protection and dissolution, the three functions performed by the Paramatman. It is the one Light that is responsible for all the three, like the wick burning inside the lamp with the three sides. One side of the lantern, let us assume, is painted red. It symbolises creation. If we remove red from the pure light of the spectrum, the other six colours also will be separated. This is what is meant by the one becoming the many of creation. Brahma, the Creator, is said to be red in colour. Another side of the lantern is painted blue. The first and last colours of the spectrum are violet and red. The beggining is red (or infrared) and the end violet (or ultraviolet). Mahavisnu, during the very act of sustaining all creation, demonstrates through jnana that this world is not the whole self-fulfilling truth but the disguise of the Paramatman, his sport. In the fire of jnana the cosmos is charred. This is the state in which an object, without being entirely disintegrated, retains its form but loses its colour: it is like a lump of charcoal. Such a entity as the world still exists, but its own quality, Maya, is burned out and is suffused with Visnu-"Sarvam Vishnumayam jagat". In Tamil Visnu is called"Kariyan, Nilameniyan"(one who is like charcoal, one whose body is blue). Blue, black and violet are more or less similar colours. The light coming from the blue side of the lantern is Visnu. The third side of the lamp is not painted. We saw that when all is burnt in jnana the residue is a lump of charcoal. But if this charcoal is burned further the ultimate product is ash. It has no form and is just powder or dust. Now the colour also changes from black to white. White is the colour close to pure light. All the colours are inherent in that light, which means all the cosmic functions and activities emanating from the Paramatman are made extinct, are burned out. Now the Paramatman alone remains. That is the ashes remain when everything is burnt out- that is what lasts in the end. It is indeed Paramesvara otherwise called Mahabhasma. Samhara, destruction, may seem a cruel function. But what Siva does, though seemingly cruel, is truly an act of compassion because he goes beyond destruction to unite us with the Truth. When Visnu sportingly bestows jnana on us the cosmos seems like a lump of charcoal. "Sarvam Vishnumayam jagat, "we say. But now all the sport has ended and we have come to the state of supreme jnana: there is neither "sarvam"nor "jagat". Now it is all "Sivamayam". It is the one lamp that is the light of the Brahman. When it is seen through the red side of the lantern it becomes Brahma; through the blue side it is Visnu; and through the unpainted side it is Siva. Our great men have in the past sung of the One manifesting as three("Oruvare muvuruvay"). There were great poets in our country who were not interested in propagating any philosophy or any system of thought- they were men possessing a broad outlook and an open mind who expressed their views freely. These poets have said that it is the same entity that is manifested as the Trimurthi(Brahma, Visnu and Mahesvara) and indeed as the 33 crore devatas. Bana says that the same Object becomes three to perform three functions, "sarga-sthiti-nasa-hetave". Kalidasa clearly states, "Ekaiva murtirbibhide tridha sa" (The Paramatman is One; it is this One that divides itself into three for the three different functions). If we were divided into two schools, the one insisting that the Saiva Puranas alone are authoritative among the Puranas and the other claiming that only the Vaisnava Puranas are to be relied upon, we would keep quarelling without ever being able to take a clear and dispassionate view of things. "The Truth is One. The wise speak of it by different names". There is no greater authority for us than this Vedic pronouncement. So all of us, without making any distinction between the Saiva and Vaisnaiva systems, must listen to the stories of all deities and be rewarded with freedom from worldly existence. Tiruvisanallur Ayyaval was a great man. His real name was Sridhara Venkateswara. But out of respect people referred to him as "Tiruvisanallur Ayyaval". He lived some three hundred years ago and was the senior contemporary of Bhagavannama Bodhendra. Bodhendra propagated devotion to Rama and Govinda, that is he taught people to sing these names of the Lord. At the same time Ayyaval spread the glory of Siva by singing his names. Neither of the two respected any distinction between Siva and Visnu. 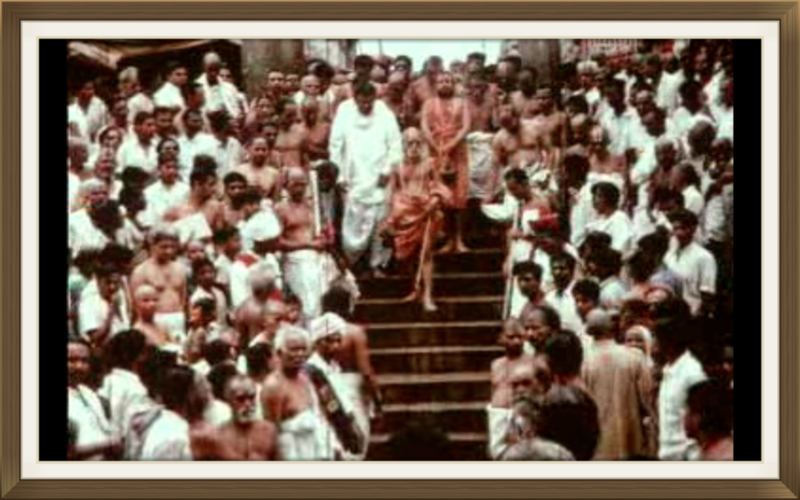 So the two of them jointly propagated the "nama siddhanta"in the Tiruvisanallur. They had respect and affection for one another and established the doctrine that in the age of Kali repeating the names of the Lord[nama japa] is the sovereign remedy for all ills. Whenever a bhajana is held obeisance is paid to these two (first Bodhendra and then Ayyaval) before singing the praises of the deities. During a sraddha ceremony Ayyaval fed an untouchable. The village headman gave the ruling that he had to bathe in the Ganga in expiation. Ayyaval made the sacred river rise in the well in the backyard of his house. This story is well known. The incident took place on the new moon of the month of Karttigai (November-December). Even today devotees in large numbers bathe in the water of this well in the belief that it is as good as taking a dip in the holy Ganga. Ayyaval gives his own account of how Sri Rama broke the bow of Siva. "Svakara pratipadita svacapah, "this is how he put it. That is Rama broke his bow with his own hands. The story usually told is that the bow of Siva was cracked by Narayana and that later Narayana who descended to earth as Rama broke it completely. Ayyaval does not like the idea of Siva being represented as inferior to Rama. He does not make any distinction between Siva and Visnu and believes that Siva is Visnu and Visnu is Rama (so Siva and Rama are the same). Logically, in his view, the bow of Siva is the bow of Rama. That is why he says Rama broke his own bow with his hands. All such acts are needed for his sport, he declares.